THE STORY - A massive creature attacks a deep-sea submersible, leaving it disabled and trapping the crew at the bottom of the Pacific Ocean. With time running out, rescue diver Jonas Taylor must save the crew and the ocean itself from an unimaginable threat -- a 75-foot-long prehistoric shark known as the Megalodon. ​​​​Just from watching the trailer you can tell what will be on offer with “The Meg”, a giant shark hunting the people who have discovered it. Whether or not that is what the viewer wants, the movie delivers on the trailers promise with interest. It takes time for it to find its stride, the first act takes too long to set up the story and provides unnecessary detail considering the rest of the movie. But once “The Meg” finds it’s rhythm the action scenes come fast and furious, providing plenty of outrageous scenarios and even more ridiculous solutions to the problems that are presented. 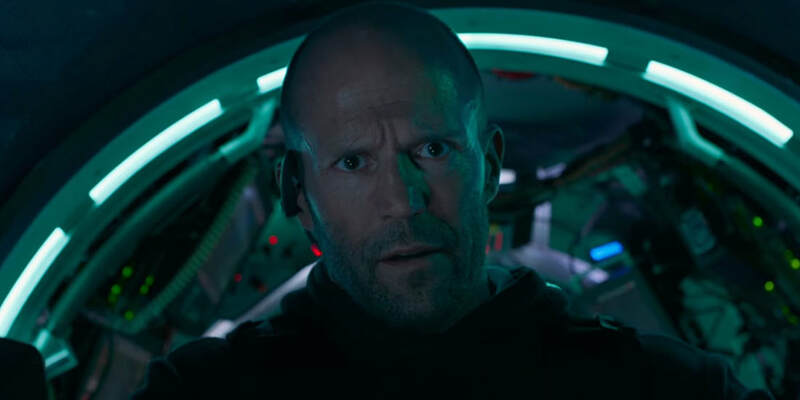 Jason Statham is the unequivocal star of “The Meg” and the first scene is devoted to setting up his character as both a super badass and as having previous experience with the dangers of the depths of the ocean. We are then introduced to a sealab and its crew, the highlight of which is Li Bingbing as Suyin, who acts as a de facto head of the scientific efforts that are being conducted. The movie then provides an unnecessarily detailed amount of information about their mission to find the real bottom of the Mariana Trench and see what lies beneath the fake one. Thankfully once the mission starts, the pace speeds up and it isn’t long before the crew of the exploratory submarine find themselves stranded on the bottom of the ocean. It’s at this point that Statham’s character Jonas is called in to play rescuer but he quickly becomes an essential part of the team as things continue to go awry. Statham, of course, succeeds in his rescue mission, but when they return to the lab they find that the giant shark they encountered below has somehow followed them. As the film continues it ratchets up the crazy ideas and visual effects and the shark itself seems to grow more vengeful with each passing moment. “The Meg” culminates in one of the more over-the-top scenes of the year, complete with mini-submarines, helicopter crashes and an excellent recreation of one of the minor scenes from Jaws. While the story makes a certain amount of sense if you are willing to check your brain at the door, it only becomes entertaining when you embrace it for what it has to offer. Judging “The Meg” on the scale of a typical Hollywood ‘A-List’ film would be a mistake as it’s far-fetched plot, predictable script, two-dimensional characters and spotty visual effects would instantly make it a joke. But when viewed in the light of B-movie with an all-star budget it’s easier to see why the film is so enjoyable to watch despite its glaring flaws. On the surface “The Meg” takes itself very seriously, which is a good thing but it quickly becomes clear the director Jon Turteltaub is well aware of exactly what he’s making. “The Meg” goes so far as to use ideas from more recent classic monster films such as "Jaws" or "Jurassic Park," for instance it doesn’t show the shark until almost the end of the first act, but it chooses them carefully and they are done with enough skill that it is more of a tribute than obvious theft. Despite “The Meg” having a decent budget there are plenty of scenes that show the limits of relying on that alone. The actors do a fine job, but the dialogue is often so laughably bad that it undermines their performances. It sets up several guidelines for its world and then abandons them as needed by the story without looking back. The sets are very well done, but the visual effects are not on par with the practical ones and in a few scenes, it is so glaringly obvious that it becomes funny. Even with all these negatives “The Meg” still manages to be a fun, if mindless, watch that’s a perfect end of the summer blockbuster for those looking for an absurd action romp.